On Unclutterer, we write a great deal about taking advantage of vertical space when organizing. Usually we’re referring to using walls for shelving or bulletin boards or creating cubbies. 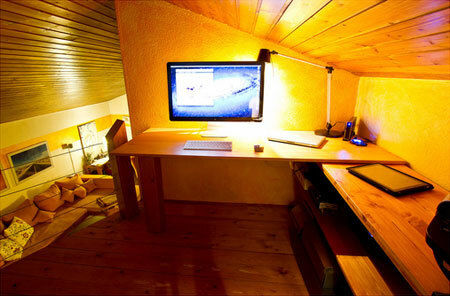 In this example, however, the vertical space in the home has been transformed into a small office. “The upper deck,” as Frederik refers to it, is large enough to fit a large monitor, task lighting, and a small bookcase for storage along the floor. There isn’t a chair pictured, but I assume there is one in the space. The most cumbersome thing about the office, I imagine, would be lugging all the equipment up into the space. Overall, however, I find it to be a wonderfully imaginative way to fit an office into a home. Thank you, Frederik, for sharing your lofted office with us. I like it! It looks cozy. This is my favorite one so far. Beautiful! I like it! Great use of that space! Love it! But I would be terrified of falling off! I still love it! 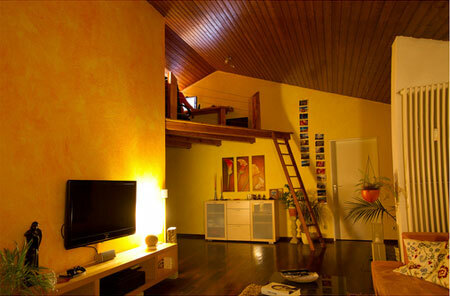 Jodi, if you look carefully at the pictures, you will see the cables strung across the open edge of the loft. They’re not very thick, but if they’re steel, they’re sturdy enough to keep Frederkik safe! It does look cozy.Me like. i can see that being a huge hit for guys or for teens. love it. I love it because it would cure me of “just popping onto my computer for a second…” (and still being there an hour later. I would have to really need to use my computer to undertake climbing a ladder. 🙂 Very great use of space. Although, I bet it is hot up there in the summer, perfect for winter being up in the warm area by the ceiling. Sooo cool! It does look really cozy. WOW..This is my favorite one so far. So Beautiful!